Auxetics are materials and systems which exhibit the very unusual properties of becoming wider when stretched and narrower when squashed, that is, they have Negative Poisson's Ratio. A team of University researchers have extensive expertise on materials possessing auxetic properties and how they can be used to develop and manufacture new or improved commercial structures and products. They have also developed a novel way of converting conventional foam to auxetic foam through the use of solvent instead of heat. The process which was developed can be divided into three steps; (1) Wetting foam with appropriate solvent, (2) Compressing the foam (3) Allowing the foam to dry well. The Poisson’s ratio obtained by this process is similar to that obtained by the heat process, a rival technology. The process can also be reversed to convert auxetic foam into conventional foam. Why opt for an auxetic material? 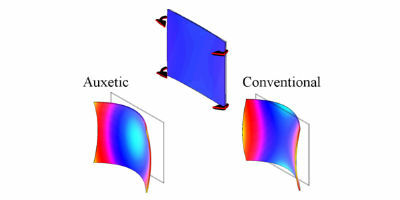 Apart from possessing a Negative Poisson's Ratio, auxetic materials display additional unique qualities such as increased shear stiffness, an increased plane strain fracture toughness and an increased indentation resistance. When an object hits an auxetic material and compresses it in one direction, the material contracts laterally. 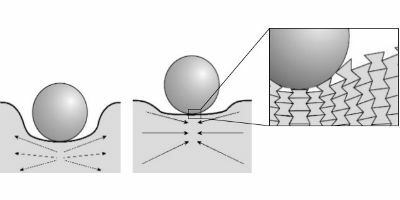 That is, material flows into the location of impact creating a denser material which is less resistant to impact. Auxetic materials are also known to have better shock and vibration absorption properties. They also have a natural tendency to form dome-shaped double-curved surfaces, unlike conventional materials which tend to form saddle-shaped surfaces. Such materials are particularly desirable in applications that require highly curved hard surfaces, such as those found in the body parts of aircrafts and cars. How can this be applied to foams? Current methods of converting conventional foams to auxetic foams focus around compressing, heating and cooling the foam. This method can be time consuming and costly when considering the heating equipment required. The proposed production process is more energy efficient than current methods since it does not require heating. This, coupled with the fact that solvents may be reused several times lowers the production costs and also allows for a more environmentally friendly process. The use of solvents also removes the risk of the foam being degraded as part of the heating process. As solvents flow homogenously, the process for converting large samples of auxetic foam blocks would be more efficient than current processes. Auxetic materials and structures can also be used to replace conventional components in various products used in specialised applications to produce higher quality products. Sporting accessories such as running shoes and garments. Nike have incorporated auxetics into their Free RN Motion shoes. Sound proofing: recording studios, theaters and the like. The foam has been prototyped. Patent granted. A patent application number GB1107220.4 was submitted by the University of Malta in the United Kingdom in May 2011. This was granted under number GB2480905 B in July 2013. Patent application number MT4236 submitted in Malta was also granted to the University of Malta. The team have extensive know how in the field of auxetics and how it can be applied to the development and manufacture new or improved commercial structures and products. We are interested in collaborating with entities to design smart materials around their technologies. Grima JN., Mizzi L., Poźniak AA., Wojciechowski KW. (2016). 'Planar auxeticity from elliptic inclusions.' Elsevier: Composites Part B- Engineering. Attard D., Bajada M., Dudek KK., Gatt R., Grima JN., Scerri S. (2015). 'Maximizing negative thermal expansion via rigid unit modes: a geometry-based approach'. The Royal Society: Proc. R. Soc. A Vol 471 Issue 2179 (20150188). Interested? Contact Nicola Camilleri or the Knowledge Transfer Office.